Jelastic, the advanced PaaS that simplifies complex cloud deployments and in use by more than 55 hosting providers worldwide, today announced an enhanced module for WHMCS billing integration available in the WHMCS and ModulesGarden Marketplaces for free download. This extension allows service providers easily get Jelastic PaaS with full integration to WHMCS billing system. The already existing customers of WHMCS can initiate the installation right from the WHMCS admin panel. For newcomers this package is available for ordering at the marketplace.With Jelastic, hosting service providers have an opportunity to grow their business by offering their users a new product that will meet their DevOps needs: managed PaaS with support of Java, PHP, Node.JS, Ruby, Python and .NET and Docker-based applications; automatic creation, scaling, clustering and security updates of microservices or monoliths; rich interface for managing cloud deployments, in addition to CLI and SSH access; auto-scalable Elastic VPS; installation of 100+ applications in one click; and many other solutions. Feel free to review the video how your end users can manage their environments right from the WHMCS panel. The discount can be even larger with pre-payment of a 6- or 12-month package. This offer is available until the 31th of December. Follow this link to check available package configurations: https://store.jelastic.com/cart.php and use the code JELASTICPROMO1 while ordering to get the solution upon the favorable terms. There is also a possibility to explore the full potential of the module with 7-day free trial of Jelastic at shared infrastructure located in the US or Canada. Order Now. “With every update, we keep making the platform functionality more reachable for the service providers – from newbies at the market to the established companies – who target SMBs and aim to offer their users a product of high quality,” comments Ruslan Synytsky, Jelastic CEO and co-founder. “Hosting providers with WHMCS accounts now can easily extend their offerings with Jelastic PaaS functionality in order to grow their businesses. 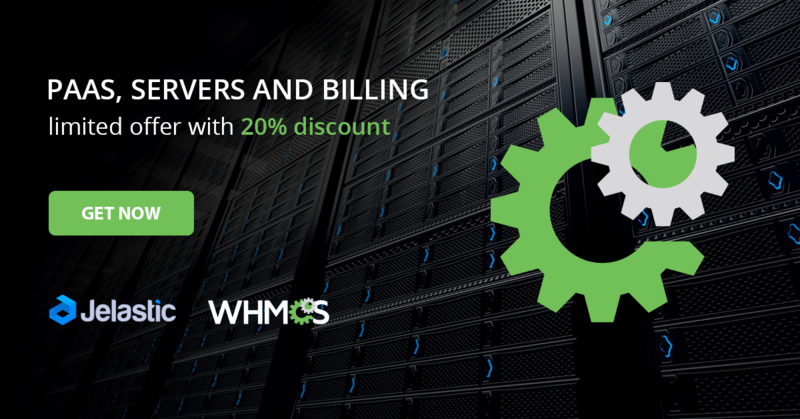 Deeper integration simplifies entry point and makes the billing process smooth for both sides – service providers and end customer,” said Matt Pugh, CEO of WHMCS. “Jelastic PaaS For WHMCS is a must-have solution for all web hosting providers who aim high and are determined to find the unique X-Factor for their business. With its help, offering a perfect combination of seamless billing and remote management of cloud environment, all based on a truly innovative model, is now within reach. ModulesGarden is proud to be actively involved in the module’s continuous evolution and delighted to contribute to its success,” says Piotr Dołęga, ModulesGarden CMO.